12/ See Exhibit C, an article from the June, 1981 QST article discussing AMTOR. EXHIBIT A. (Copy of CCIR 476-2, from document entitled 'I Recommendations and Reports of the CCIR, 1978, XIVth Plenary Assembly, Kyoto, 1978, Volume VII, Mobile Services, Geneva, 1978, ISBN'92-61-00731-7,, under Direct-Printing Telegraph Equipment in the Maritive Mobile Service, (Question 5-2/8)). 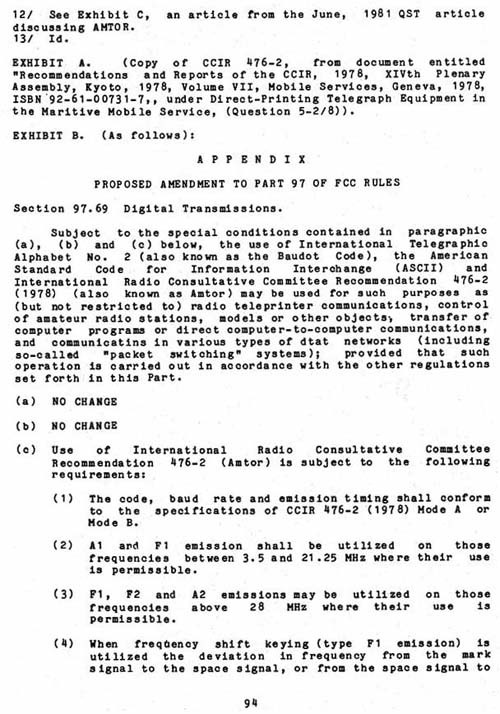 Subject to the special conditions contained in paragraphic (a), (b) and (c) below, the use of International Telegraphic Alphabet No. 2 (also known as the Baudot Code), the American Standard Code for Information Interchange (ASCII) and International Radio Consultative Committee Recommendation 476-2 (1978) (also known as Amtor) may be used for such purposes as (but not restricted to) radio teleprinter communications, control of amateur radio stations, models or other objects-, transfer of computer programs or direct compute r- to-computer communications, and communications in various types of data networks (including so-called "packet switching" systems); provided that such operation is carried out in accordance with the other regulations set forth in this Part. (1) The code, baud rate and emission timing shall conform to the specifications of CCIR 476-2 (1978) Mode A or Mode B. (2) Al and Fl emission shall be utilized on those frequencies between 3.5 and 21.25 MHz where their use is permissible. (3) Fl , F2 and A2 emissions may be utilized on those frequencies above 28 MHz where their use	is permissible.